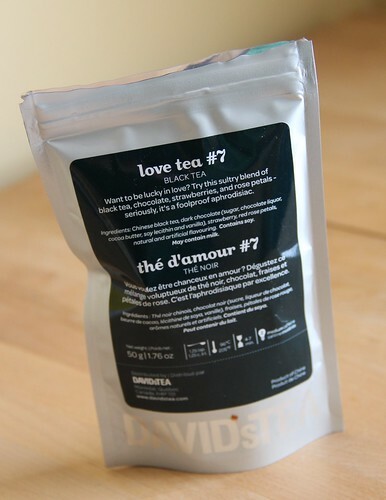 When I ordered from David’s Teas mid-February, one of the teas that they were promoting was Love Tea #7. It sounded delicious so I added it to my cart. 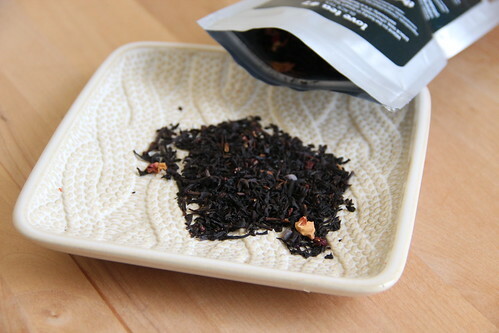 From the website, it includes Chinese black tea, dark chocolate (sugar, chocolate liquor, cocoa butter, soy lecithin and vanilla), freeze-dried strawberry, and red rose petals. Love Tea #7 is available in four sizes: 50g for $6.50, 100g + free tin for $13, 250g + free tin for $32.50 and 500g for $65. When I opened the bag I could smell the strawberry most of all, but also smelled chocolate. It was rich and sweet and even after I had closed the bag I could still smell it lingering in the air. Once brewed I could smell the black tea, but also still a sweet strawberry smell. Overall it is a sweet, slightly fruity dessert tea. I get little hints of all the ingredients. I enjoyed it quite a bit, although I do have to say that this is one of the ones that smells even better than it tastes.